Self-Care for the Super Busy! Ever speed down the driveway to go to work and discover – from a THUNK and deluge of brown liquid running down the windshield – that the traveler cup of coffee you couldn’t find as you raced out of the house was right where you left it… on the roof of your car? 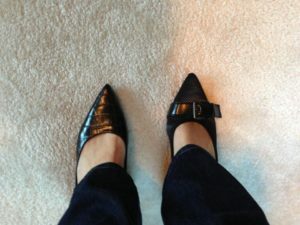 Ever rise in the pre-dawn hours, dress by flashlight so as not to wake a sleeping spouse and not realize until you get to the office that you’re wearing two similar – but clearly different – shoes? Ever have those days when you’re so busy you FORGET TO EAT? A hustle that is better described as a tizzy. And then we get up and do it all over again. All of this busy-ness and tizzy-ness and stress is taxing our bodies and our physical and mental well-being. But how does a Super Busy, Super Stressed out woman have time to take care of herself? She doesn’t. But she should. Because “being stressed out all the time, eating out of vending machines,” is no way to live. So says Caryn Sullivan, health and wellness expert, motivational speaker and owner of Pretty Wellness. She spent years in the corporate world – that was her description of the environment: “eating out of vending machines” – and, like many of us, struggled with too much to do in too little time. Unlike many of us, Caryn was and still is fighting a bigger battle – stage IV metastatic breast cancer. She was first diagnosed in 2004 and found her cancer returned in 2013. Always positive, Caryn used the diagnosis to commit to a healthy and full life. She now motivates audiences with her healthy living expertise and also speaks and writes about cancer resources. Her book, “Happiness through Hardship – A Guide for Cancer Patients, Their Caregivers and Friends During an Initial Cancer Diagnosis” can be ordered HERE. 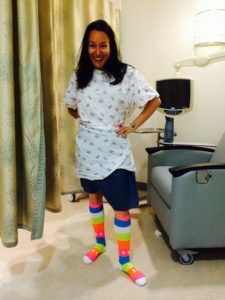 Caryn is living – well, actively and joyfully – through cancer. She wants to help others live well, active and joyful lives too and says it shouldn’t take a health crisis to make us take care of ourselves. And that’s not all. We’re not as productive at work either. That all sounds familiar to me, this blur of our busy days. So how do we do that when we’re Operating in a State of Crazy? Seriously… how do we make time for self-care when we can’t even find time in between meetings to pee? Caryn says we need to determine where our resistance lies. Do we truly not have the time? Or does change – even positive change – make us uncomfortable? Are we willing to stray from our couch-sitting, Malbec-sipping comfort zone? Caryn suggests starting the day with a cup of warm water with lemon, an easy step towards eating clean. Lemon water helps rehydrate us after waking up and the acidic fruit alkalizes and detoxes our system. She’s right. I tried it. I didn’t mind it. I didn’t give up my morning cup of coffee (when I don’t leave it on the roof of my car) but I now precede the caffeine with lemon water. And after a week, I started noticing my body anticipated it, even craved it. 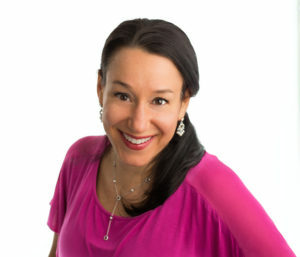 Caryn recommends short breaks throughout the day to manage stress through a simple breathing technique – in through the nose and out through the mouth for 10 beats. For stressful transitions – work to home and home to work – she suggests using a readily available meditation app. The brief pause of as little as 3-5 minutes helps hit the re-set button. This one was hard for me. I’m sometimes so keyed up, I have a hard time sitting quietly, minding my breath. Even the breath feels like it gets stuck in my chest. But here’s the thing – it works. And it gets easier, even enjoyable, as you become accustomed to doing it. This one seems obvious, right? Then why don’t we do it? Because ricotta stuffed shells are just so good! She recommends fruits and veggies for nutrients and fiber and batch-making smoothies over the weekend to keep in the freezer and defrost overnight. I tried it. What I Learned from Photographing my Food helped me to “see” what I was putting in my body. Ready for more? 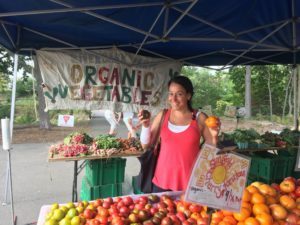 Caryn offers these 50 Clean Eating Tips on her website, simple things individuals can do to immediately improve their health and well-being. In order to improve our personal efforts, Caryn encourages companies to get to play a role in promoting employee wellness. Sounds good to me. I’m making my new habits habitual. How about you? What are your biggest self-care challenges? For more healthy living tips, follow Caryn Sullivan @PrettyWellness. Valerie Gordon is a life-long storyteller and the founder of Commander-in-She, LLC. She writes about career challenges, the elusive work-life balance and various other topics that make her laugh. Sign up for her monthly newsletter and follow her blog at Commander-in-She.com. "Just the right balance of serious stuff and comic relief!" "What a fun way to think about what is next in life and career!" "I enjoyed Valerie's discussion points and being able to follow along/have prepared notes to think about. My biggest takeaway was looking at my background and seeing if it matches who I am today."